Below are the seven finalists for the Farmers Guardian’s Show Business 2014 competition. The winning show will follow in the footsteps of Mid-Devon and Turriff Shows, and will receive a comprehensive media partnership with Farmers Guardian. The package will include a show preview in Farmers Guardian, a journalist and photographer attending and reporting on the show, and advertising, including significant social media exposure. All finalists are working hard to encourage the next generation, are raising money to help local causes, and are also playing a significant part in educating visitors about farming, as well as being key parts of their local community. THE Aberystwyth Show was established in 1943. During the early 1990s, with an increase in entries, particularly the horse section which peaked at nearly 1,000, we established ourselves as the Aberystwyth and Ceredigion County Show. We are currently experiencing an increase in popularity of other livestock sections. For example, the poultry entries, probably spurred on by the increasing interest in poultry husbandry, have increased rapidly and we are now a Regional Poultry Club of Wales show. Being a county show, we recognise the importance of supporting our local and native breeds, with strong competition in the Welsh Mountain Ponies and Cobs, Tregaron Welsh Mountain Sheep and Welsh Black Cattle classes. Involving and inspiring youths in agriculture and the countryside is very important to the committee. Each year, we arrange competitions for young handlers in the cattle, sheep and horse sections to nurture their talents. Local primary schools battle it out for the coveted trophy for the school gaining the highest number of points, and we hold a number of demonstrations such as fly tying and wood carving in order to promote and preserve rural crafts. The 21st Century also saw the introduction of the popular vintage section, which forges links with past and present day agriculture. Despite this, we recognise that there is work to be done to increase our visitor numbers. In the face of the economic downturn our sponsorship and advertising sub-committee has worked incredibly hard on strategies to increase gate numbers and sponsorship revenue, but advertising in particular has proved difficult with such a limited budget. Holding this annual event incurs considerable costs in the hiring of the show field and marquees. We have 15 committee members and rely on the good will of a number of dedicated volunteers, such as our local farmers who are on hand to set up the show field, even though this involves juggling their regular duties on the farm. We have lost a few committee stalwarts in the past few years, but it is pleasing to note that a new generation of young, enthusiastic volunteers are showing interest and helping to organise the show. We would like to encourage their hard work by winning this media partnership and ensuring that they and the rest of the county have a show to be proud of for years to come. CAMELFORD Show has an earthy zest; which is fundamental to its identity. Starting life as Camelford Horse Show, it evolved into the true agricultural event it is today: serving the farming fraternity with thriving livestock sections and agri-business stands; while still embracing local involvement and equine roots. Located in an Area of Ooutstanding Natural Beauty, the show’s other essential element is holidaymakers - providing an attraction and rural experience for the general public. Once adjacent to the town, the showground is now situated on 20ha (50 acres) close to the North Cornish coast. Off-show events are involving the wider community and raising our profile, enabling us to make an annual donation to a charity of the president’s choice. A large swathe of the committee can trace their family back through the show’s records, and are actively engaging the next generation in showing and stewarding. Junior (under 11s) and senior (11-16s) cattle and sheep young handlers progress, each show, to an overall young stockman’s championship - a real headache for any judge, but terrific fun and a real crowd pleaser! We’re proud of the diversity of breeds exhibited, something often mentioned by showgoers - creating a great opening for dialogue between farmers and visitors. The sheep shearing competition is so popular, we’re considering introducing other such activities, such as milking the cows. We try to avoid aggressive commercialisation, which is how the entertainment ring originated. Its programme tends to be countryside-themed, with just one ‘brought-in’ act; the remaining timetable being filled with fast and furious local entertainment. Camelford YFC has its own tent, complete with in-house competitions and a post-show party. The horticulture and handicraft tent is like a village show in its own right. Along with the thriving poultry section, the ever popular pet dog show, food hall and vintage section; the variety of displays are all hotly contested by a cross-section of exhibitors. A highlight for many youngsters is ‘Big Top Mania’ - the circus skills workshop that runs all day as a free children’s activity. Our show has survived several knocks in recent years: a few outright cancellations and some ‘partial’ shows - all due to either unseasonably wet conditions or FMD. Making 2014 a successful year is of paramount importance to the ongoing stability of the show. A leg-up from Farmers Guardian and its readers would help us continue laying the rural stepping stones for future years and generations. CHIPPING Show epitomises everything that is good about a small village show. Chipping show has a long history; the first show was held in 1920 and, apart from breaks for the war and FMD, has run ever since; this year will be the 87th annual show. The show and the local village community are inextricably linked by the tradition that has played out every year for nearly a century. Chipping is a village with a population of about 1,000 located in the beautiful Ribble Valley in Lancashire. The village nestles just to the south of the Bowland Fells, close to the market town of Clitheroe. The land is a mixture of sheep country and pasture, providing excellent grass for cattle rearing and dairy production. There are classes for cattle, sheep, Shetlands, Shire horses, light horses, poultry, pigeons, flowers, vegetables, baking, jam/wine-making, handicrafts, photography, cheese and vintage farm machinery. There is a huge emphasis on encouraging children and young people to take part and exhibit in the show. The local primary schools co-ordinate entries into the children’s classes, including competitions for growing the best potatoes! Chipping YFC runs a section with classes open to neighbouring Lancashire YFCs. The junior shepherd and junior stockman competitions are often the highlight of the day. In addition to the classes, there is a full programme of entertainment throughout the day in the main ring. This year the prestigious ‘Sheep Show’ is the main attraction, which fulfils the aim of entertaining and educating the 5,000 plus visitors about the importance of farming and rural activities to the well-being of the area. In recent years, sheep racing, egg-catching and lawn-mower racing have been very popular. There are dozens of trade stands plus marquees dedicated to the best of local food production and rural art/crafts. The cheese show is one of the best in the north of England; cheese makers from across the country exhibit at Chipping in the hope of getting a coveted ‘champion’ award. The show is run by volunteers, with an active committee of about 30 members who work tirelessly throughout the year to bring everything together on show day. The show likes to give back to the local community, and in recent years has given donations to the children’s playground, skate park and St Mary’s School gardening club to name a few. THE Hodder Valley Show prides itself on being a traditional agricultural and horticultural show and a perfect family day out, with something for everyone to enjoy. Every year we are visited by upwards of 3,000 people, experiencing a slice of rural life in our community. This year we celebrate our 70th Show and can trace our history back to 1864, being unique in the fact that the show is hosted by the farmers and landowners of Dunsop Bridge, Newton-in-Bowland and Slaidburn in turn. No two years are the same and visitors enjoy the fabulous scenery with breath-taking views of our beautiful valley, in the Forest of Bowland AONB. Our agricultural section is a vibrant show case for native and continental breeds, with more than 95 cattle and 345 sheep exhibited; over 80 sheep are entered into the YFC sheep classes alone. Prior to show day, local showmen train our young handlers at workshops, culminating in a fabulous main ring final. We also have a well-supported Silver Spoon heavy horse section. The sheep shearing involves local young shearers competing, with entertaining commentary of the skills required, the audience being invited to power the shears by pedalling a bike. The sheep dog trials prove very popular with the dogs and handlers never failing to impress. In the horticulture tent local gardeners, bakers, school-children and floral artists excel with their vast array of fantastic exhibits. The rural craft and farmers markets are bursting with delicious locally produced and reared food and gifts. 2014 sees us hosting an English championship fell race, a first for the valley, attracting a national field of runners. Main ring delights educate and entertain with Dog and Duck, dad’s and lad’s ATV handling, vintage tractors and the grand parade. Musical interludes are provided by our rousing Slaidburn Silver Band with our traditional finale encouraging exhibitors and visitors of all-ages to join our egg catching competition. All this is pulled together by our show committee, a non-profit making charity, of enthusiastic, hard- working farmers and friends, who aim to provide our visitors with an insight into how our community works, coupled with a day out to remember. This year we are supporting the Farmer’s Walk for Cancer, which goes from pub to pub, auction to auction, culminating in a joint night of celebrations. Farmers Guardian’s support would be invaluable in enabling us to welcome new friends; come and join us, we’d love to see you. SKELTON Show is reputedly the largest village show in the North of England. While promoting the interests of farmers, horticulturalists and other parties to facilitate co-operation and improvement, it has constantly sought to evolve and respond to the changing needs of rural life including embracing social media and on-line bookings. Its success emanates from a strong progressive committee of volunteers who have constantly sought to make an annual ‘showcase’ of country life with something to interest all the family. 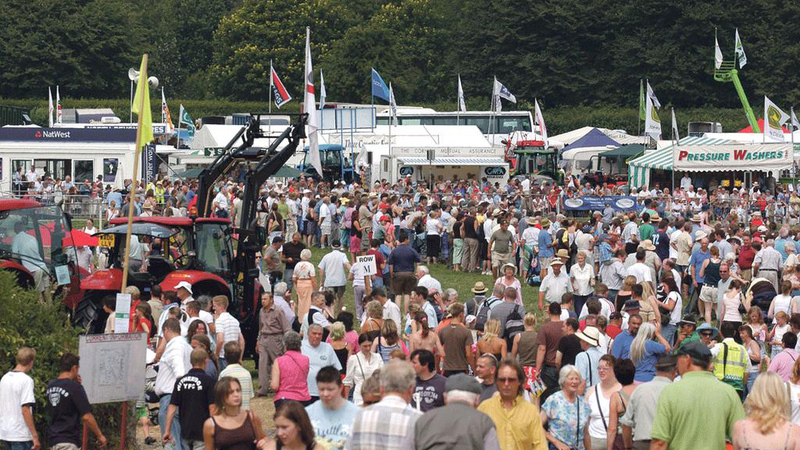 Since establishment in 1880, the show has evolved and now offers a great day out whilst actively promote farming with an annual attendance approaching 10,000. Exhibitors compete for 130 trophies with more than £12,000 in prize money. As well as cattle, sheep, dogs, horse and pony classes, a large marquee hosts the horticultural and industrial exhibits along with fur and feathers. Outside - a vintage vehicle display, Cumberland and Westmorland wrestling, the ever popular terrier racing, over 120 trade stands, rural craft tent, Cumbrian food hall, pet show and a wide variety of catering and bar facilities all add to the enjoyment of the day. We provide educational entertainment to promote the countryside which last year included ‘The Sheep Show’ and ‘Birds of Prey’ as well as music and children’s entertainment. While maintaining its roots as a traditional horticultural and agricultural show, over the years we have sought to diversify and successfully expand our offering. Recent additions include an inter-schools challenge and a young handler competition with qualifiers held at a number of preceding local shows. This year we have partnered with the local auction company to sponsor young people to buy and show their reared calves. We are also developing closer links with Newton Rigg agricultural college. In promoting rural country life and enjoying strong community support, the society’s ethos is to support local tradesman/suppliers and through prudent management has developed reserves necessary to sustain the event through rough times. Through such management we have also made worthy donations including £10,000 to the Cumbria Community Foundation to support the victims of the Foot and Mouth Disease in 2001. A number of weather related cancellations over recent years have severely depleted our reserves and we are planning the 2014 show on an extremely tight budget. Winning this promotional package would make a huge difference to marketing this popular event as we strive to achieve record entries and attendance for 2014 and beyond. THE organising of Stranraer Show is a real community effort. We have a staff of one who is supported by a committee of 27 dedicated volunteers. They in turn are backed by the local community. We are extremely proud of our show and the fact that so many people give up their time to ensure farming is showcased in such a positive way. The show is the largest one day event held in the Stranraer area. Livestock and agriculture remains the main attraction and the day provides a unique opportunity for visitors to view some of the best animals in the country up close. We receive tremendous support from our livestock exhibitors, with our dairy cattle section being one of the largest in Scotland. A major success story is our young handlers section and if the enthusiasm shown is anything to go by, the future is bright! There is no greater advert for agriculture than 20+ young people parading their livestock with great skill and pride. The sheep shearing demonstration gives a great insight and is hugely popular. Our local vintage tractor club provide a wonderful glimpse back to yesteryear and everyone enjoys comparing the vintage machinery to the modern day kit on display. We run a competition in conjunction with the 13 local primary schools to design a poster promoting the show. The winning design is used in our marketing campaign. This has been a great way of involving the community and raising the show’s profile. Every local primary aged child and several local organisations receive complimentary admission passes. We also work hard to ensure that our admission prices are kept low so that the show is accessible to everyone. Local organisations are encouraged to take part in the day. Over the last few years our local cheerleading club, primary schools and the regional canine rescue centre have taken to the main ring to entertain (not all at the same time though!). Our homecrafts marquee is always packed and competition is fierce, with our homecrafters capable of giving Mary Berry and Kirstie Allsopp a run for their money! We have a huge children’s section here too with free entry. There is no chance traditional rural skills are going to disappear in Stranraer! The craft and produce marquee showcases the best of what the region has to offer. Cookery demonstrations take place and, along with our Can’t Cook, Won’t Cook challenge, have proved a highly effective ways of promoting local produce. We think we would be worthy winners of the Farmers Guardian’s Show Business 2014 Competition as we have no large marketing budget, we’d not normally gain nationwide coverage, we are organised and run mostly by volunteers who go to great lengths to ensure that farming is showcased in the best possible way in our community, and for such a remote area of Scotland our livestock entries are outstanding. THE Wayland Show is one of the country’s longest-running one day agricultural shows, organised by the Wayland Agricultural Society CIC and run by a small army of volunteer committee members. It is non-profit making with all proceeds going to local charities and good causes. The first recorded show dates back to 1851, and the event has seen a real resurgence in recent years. The show reached a new high in 2011 with best ever recorded attendance figures and monies raised. Then in 2012, disaster struck. On the eve of the show, with the showground constructed and all ready to welcome visitors, flood water caused the water pumping station on the neighbouring field to leak sewerage onto part of the showground.The show was ‘off’, everyone’s efforts of the past 12 months in vain - and the entire future of the Wayland show at risk due to the enormous costs. Thankfully, however, it was saved thanks to the overwhelming support of many standholders, show entrants and sponsors who donated their investment rather than take a refund - and to Anglian Water, who donated financially and is sponsoring the grandstand for the next two years. This support, allied to that of the local media, gave everyone the lift required to produce a 2013 show that was to beat all others with an attendance of over 15,000, car parks overflowing and traffic queueing up to two miles. Consequently, the society donated a record £25,675 from the show to local good causes and charities including pre-school and primary schools, clubs of the disabled and local hospices (32 in all). The pre-Show Ball raised another £11,800, for EACH (East Anglian Childrens Hospices). The show’s young achiever award , won by young farmer Emma Germany in 2013, has been expanded for 2014. The show in 2013 used two local youngsters who are starting their own businesses to provide a promotional video of the show for the website and a phot library for future marketing. Both worked for expenses only in return for promotion in the programme and credits. The show’s organisers are already inundated with booking enquiries and livestock entry enquiries. Best of all, the Wayland Show is still a ‘real’ agricultural show for the family and local community, celebrating all that’s best in livestock, agriculture and rural living.